‘Green’ and ‘sustainability’ are popular terms these days. It seems that individuals everywhere are doing what they can lower their energy expenditure and lessen their impact on the environment. Home automation allows homeowners to become good stewards of the earth by controlling the major home systems so that three is less energy waste. Automating your house allows you to transform your ordinary house into a smart home. 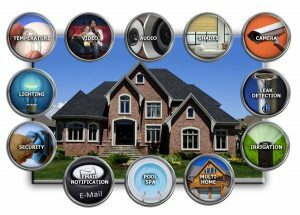 Advances in technology give property owners remote access and automatic control over various devices, appliances, and systems in their home. By just pushing a button, you can effortlessly control the HVAC system, lights, appliances, security systems, audio/video system, and more. Automation allows you to have the power to control how much energy you are using while you are at home or away. An automation system allows you to schedule your house systems and appliances to turn on and off throughout the day when not in use. Your program to have your lights turn off automatically at a particular time when you know your house will be empty and then have them turn on again when it is time for your family to get home. You can as well manage your AC system so that it runs on full strength only when the family is at home. Scheduling your systems and appliances so that they turn on and off throughout the day is a smart way of conserving energy. Remote access is another great feature that gives property owners control over their house. With the push of a button, you can easily adjust the temperature of your interiors, check your security system, or turn on the lights. You can install sensors to ensure that when someone walks into the house, or in a specific room, specified appliances engages. Just like the automatic scheduling feature, sensors and remote access allow you to reduce energy waste, save money and improve the security in your home. Heating and cooling your house accounts for over half of the average energy consumption. Automated sensors and thermostats allow you to reduce your power expenditures associated with maintaining a proper indoor temperature. Automatic control over the AC system is one of the most beneficial money-savers available to property owners. You notice a huge difference in your energy bills, and you will be doing something great for the environment. If your home automation sounds like something that can benefit you, talk with installers in your areas and find out the available options. Whether you start with a basic control system or go for total property automation, you will appreciate the many advantages associated with these systems. The bottom line is working with a reliable automation company.